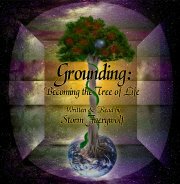 Grounding is a most, if not the most, important first step to any ritual, magical or otherwise. When we have been grounded, we have undergone several meditative steps and visualizations in order to focus our awareness, and to cleanse ourselves from any extraneous thoughts or emotions that might prove distracting, or even harmful, in a ritual setting. Soothing ambient music serves as the backdrop for this sensual guided journey that includes a full-body relaxation, as well as steps for energetically connecting with the planet, the heavens, the five elements, and aligning with one’s own Divinity. This CD will guide you through a complete Grounding meditation that you may use either as an addition to your current spiritual practice, or as the basis for starting one.